The crystal forming robots are a physical simulation of a growth process, similar to the growth of crystal structures. Each robot operates autonomously and is driven by the light of the overhead projector. When a robot has collected enough energy through its solar panel, the energy is all released at once through a small motor and the robot will make a random movement. The robots are equipped with tiny magnets, so that when they come close while they are moving, they attract each other and dock together. Over time a crystal-like structure emerges from more and more little robots forming larger clusters. Through the overhead projector this process is magnified and an abstract real-time movie of the real physical robots is projected to the wall. An interview on the project was published on the art and design blog we make money not art. For the Japan Media Arts Festival I would like to propose a new installment of the piece that highlights the different structures that emerge over time. The basic idea is to use hand-drawings to document the different end-states of the crystallisation process. 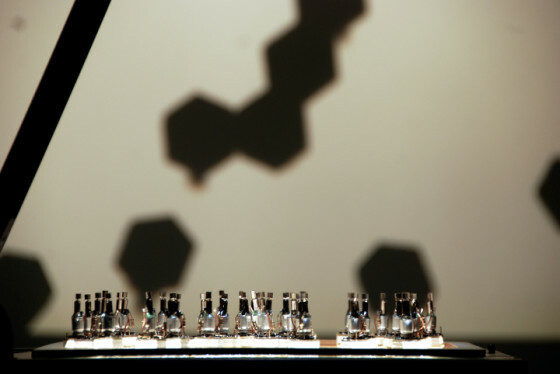 Initially the robots are placed on the overhead projector in a regular chessboard-like pattern, after about an hour they all have clustered into either one large crystal like structure or into two or three larger clusters. At this moment the process has converged and the robots should be manually reset into the chessboard pattern. Then again the robots will self-assemble into crystal like structures, that look similar to the previous structures at first glance but that differ in every detail. To document this process I would like to project onto a white paper-canvas and use a black brush or marker to draw the outlines of the final projected structure. Every hour, when the crystal building process has converged the outline of the new structure is drawn by hand on top of the previous one and over time on the canvas a layered image is created. This drawing tells the history of all repetitions and documents all the variations between the different runs. For the installment at the Japan Media Arts Festival there should be two projectors, first a projector with the robots and second an empty projector just used to highlight a second canvas with the traces of previous experiments. I will create this canvas over the next months till the festival. Along with the first projector there will be an instruction set for visitors, how to re-place the robots after the crystal building process has converged and an invitation to draw the outlines of the robots on the canvas on the wall.